The first time I found Cudonia circinans, I was already making up names for the new Helvella species I had discovered (Helvella kuoii was at the top of the list) when I figured I'd better take a look at my find under the microscope. Oops. The long, needle-like spores were like no spores I had seen before, and they were certainly not the elliptical spores of a Helvella species. 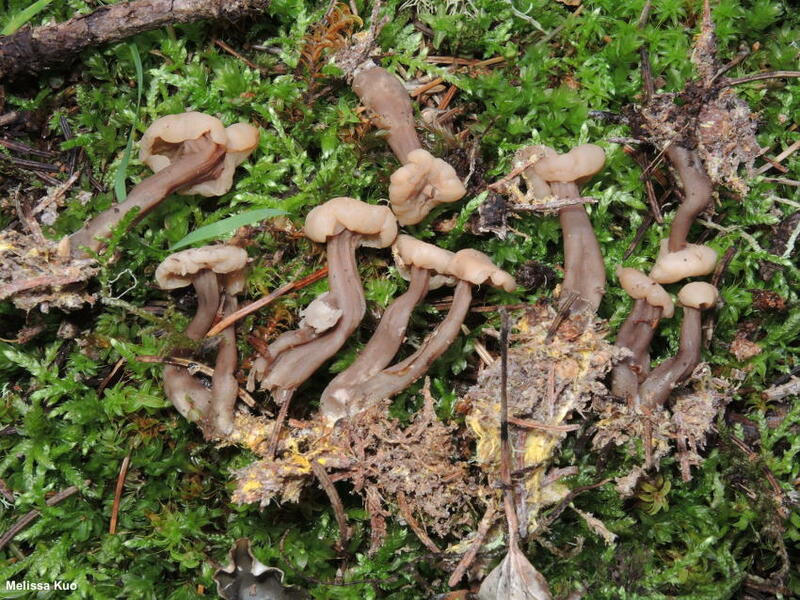 Cudonia is one of several remote ascomycete genera with needly spores, and my find fit the description of Cudonia circinans, which grows under conifers and has a pale yellow to brownish cap, with a somewhat darker brown stem. Cudonia lutea, by contrast, is brighter yellow, grows under hardwoods, and has a stem colored like the cap. 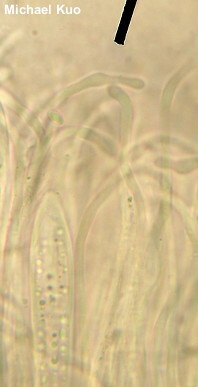 The definitive feature separating the two species, however, is spore size (over 50 µm long for Cudonia lutea and under 40 µm long for Cudonia circinans). Ecology: Presumably saprobic; growing scattered to gregariously or in clusters on the duff of spruces and other conifers, and occasionally on well-rotted wood; late summer and fall; widely distributed in northern and montane North America. The illustrated and described collections are from Michigan and Colorado. Cap: 10–20 mm across; cushion-shaped to irregularly convex, with the margin curled under; upper surface bald, sometimes a little wrinkled; dry; creamy to pale pinkish tan; undersurface similar to upper surface. 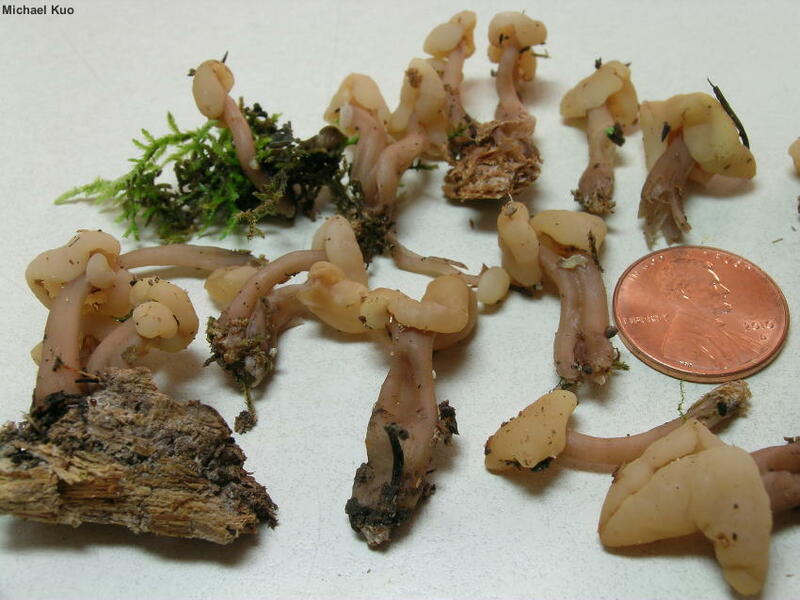 Stem: 15–30 mm long; 2–5 mm thick; dry; bald or very finely fuzzy near the base; often with longitudinal grooves or ridges which may extend onto the undersurface of the cap; brown to purplish tan; attached to copious underground, sulphur yellow mycelium. Flesh: Thin; insubstantial; not gelatinous. 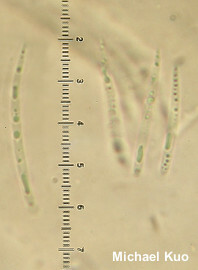 Microscopic Features: Spores 35–40 x 1.5–2.5 µm; cylindric with one aciculate end and one end merely rounded; often a little curved; smooth; hyaline and multiguttulate in KOH. Asci 75–125 x 8–11 µm; fusiform, with subacute apices; hyaline in KOH. 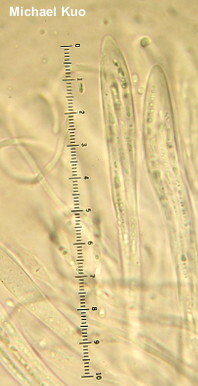 Paraphyses 75–150 x 2–3 µm; filiform; often exceeding the asci and curving or looping; apices varying from subacute to subclavate or merely rounded; smooth; hyaline in KOH. REFERENCES: (Persoon, 1797) Fries, 1849. (Fries, 1822; Saccardo, 1889; Mains, 1956; Smith, Smith & Weber, 1981; Breitenbach & Kränzlin, 1984; Arora, 1986; Barron, 1999; McNeil, 2006; Miller & Miller, 2006; Trudell & Ammirati, 2009; Beug, Bessette & Bessette, 2014; Evenson, 2016; Siegel & Schwarz, 2016.) Herb. Kuo 09130409, 08201202, 08131503.